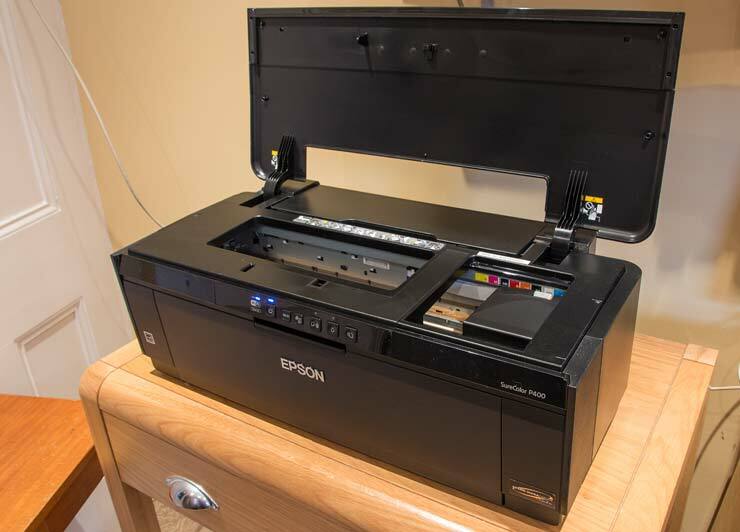 The Epson SC-P400 is a pigment ink based 13″ width printer. 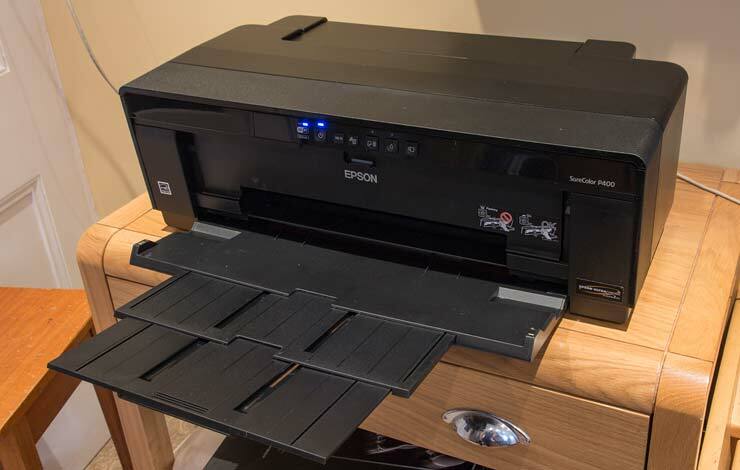 It is the third of Epson’s SureColor desktop printers to appear in 2015 that Keith has reviewed in detail. We’ve had the printer long enough to give it a pretty thorough testing – so please do make use of the comments feature at the end if you’ve any specific questions. The printer was delivered with inks already installed, but initial setup is a very easy process, loading the ink carts and giving the printer some 5-10 minutes to sort itself out. The review concentrates on using the printer for high quality print output, rather than covering the bundled software in any great depth. All testing was carried out with an Apple Mac (OSX 10.10,11) and Photoshop CS6. Functionality and operation should be just the same on a Windows PC. What do you get with the SC-P400? 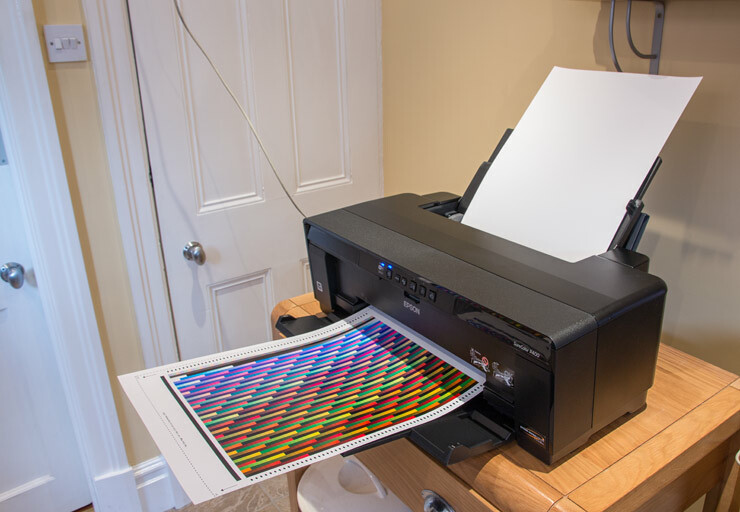 The printer is quite compact, but do note the examples of printing on board later on, for the clear space needed at the back if you print on solid media. Highly accurate printing with min. ink droplet size of 1.5 pl. The USB was connected to my MacBook Pro and the Ethernet to the house network, for use from elsewhere. The wireless was perfectly adequate for printing, but without a screen on the printer, I’d suggest it’s easier to initially set up the print with a direct connection. 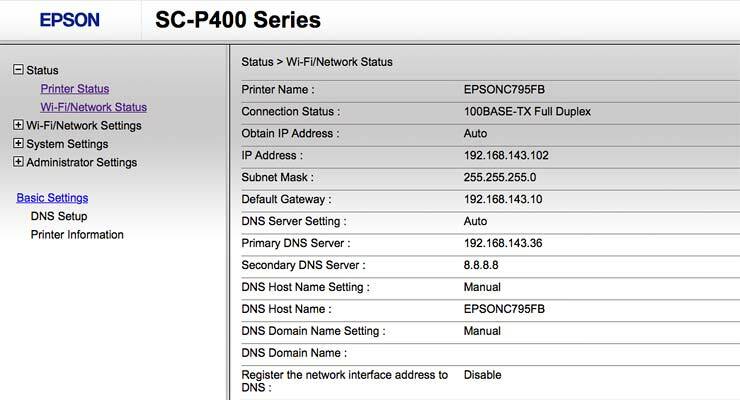 The supplied disk is actually not much more than a way of linking to Epson’s installation web service, which is very easy to use and walks you right through the software (and networking) setup. There is a large ‘start here’ guide with the printer too. 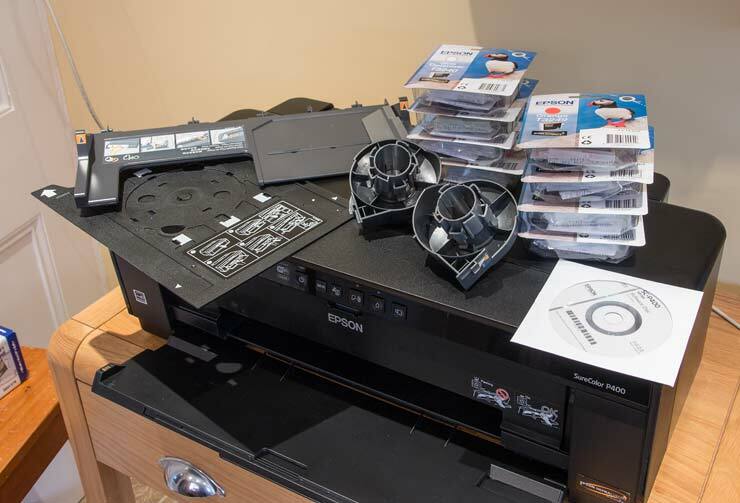 One minor issue with the Epson setup, is that right at the start you need to put in the model number. 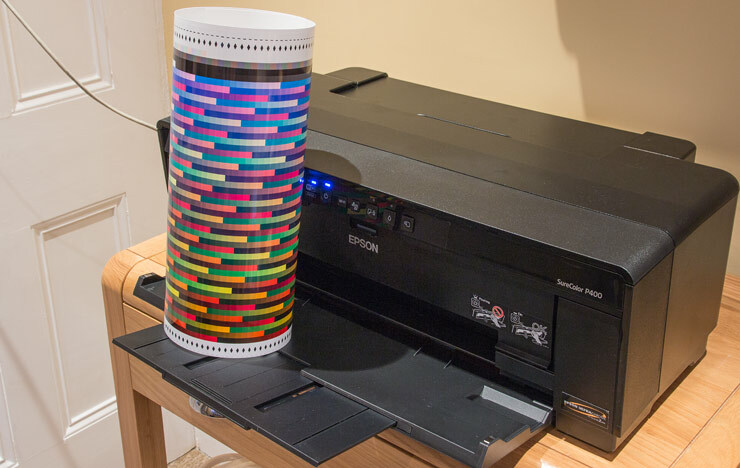 Unless you enter it exactly, it won’t go on (smarter search please Epson). Once you’re underway though, it really is a simple matter to set up. I’d forgotten that I’ve only got the 5GHz WiFi band enabled on our network – normally this wouldn’t be an issue. 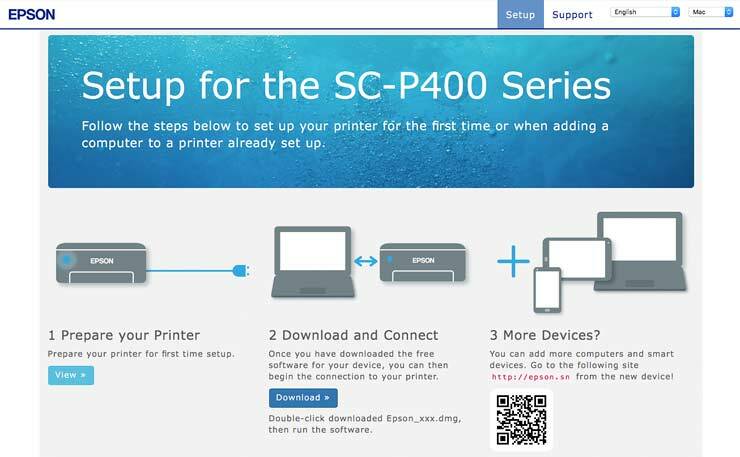 As is the way with most bits of kit these days, the printer has its own web page that you can check for configuration and several printer setup options. It’s found a home on our Ethernet Network without any problems. Basic information like the ink levels is also available. The printer itself has just a few buttons for paper loading and ink change. 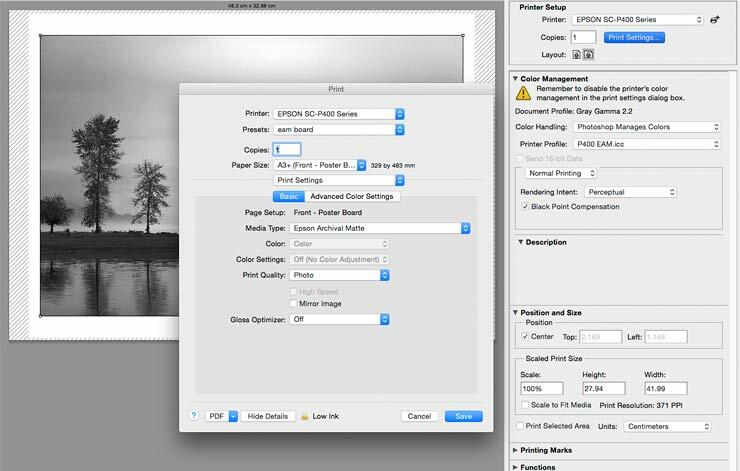 I’m doing most of my printing via Photoshop (CS6), using custom printer ICC profiles to match the paper. 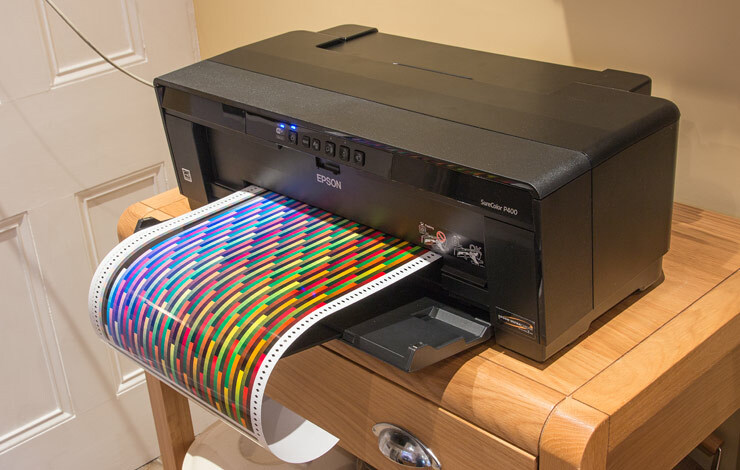 Epson supply a range of profiles for their own papers, and they are very good. Even though I make my own, I was quite happy with the Epson ones installed. Papers tested and also profiled during this review. I also tested some third party papers to see how they would profile, and how they would look with the Hi-Gloss 2 ink set. ‘Best Photo paper’ – from a local stationary store – an A4 pack of their ‘best value’ photo paper. The Lustre is a paper I use as one of my standard ones for our commercial prints, whilst the ‘Satin’ is a modern version of the old Ilford Baryta Silk. The two Pinnacle papers are from Paper Spectrum – a local paper supplier. As is our usual practice, the profiles are available on request for non commercial and educational use (please say what you need- not just ‘all of them’). There are more details about profiling this printer later in the review. 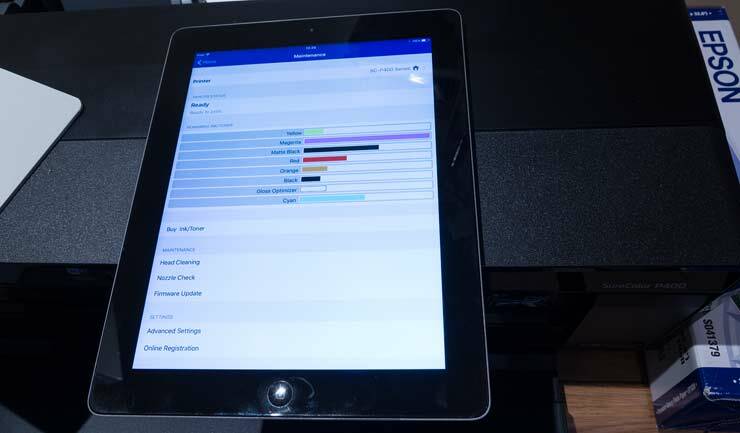 I don’t use our iPad for much more than controlling my CamRanger atop a tall mast (Photos from 8 metres) but it connects to the printer very easily with the Epson software (worth installing since it gives a lot more control over printing). A quick check of ink levels. 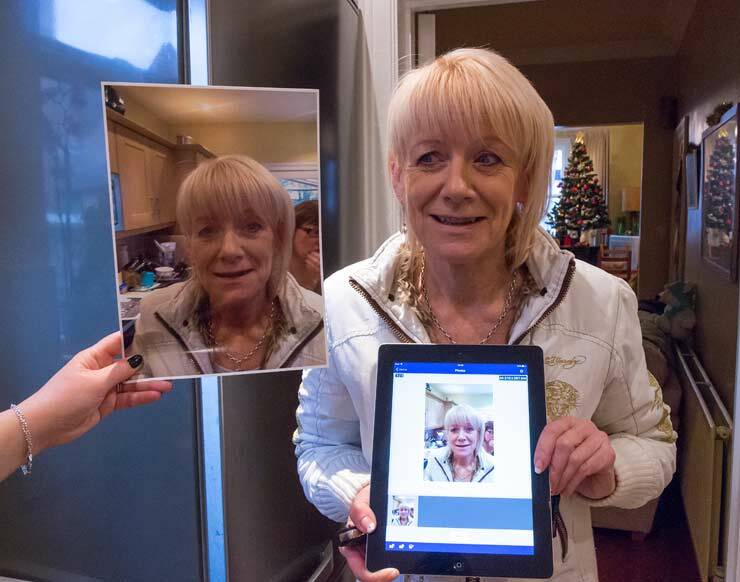 Here’s a photograph of one of Karen’s friends – printed only seconds after taking the photo. It’s printed on the cheap glossy A4 photo paper I’m using for some tests. The rather mixed colour is a combination of 2850K halogen ceiling lights, overcast daylight and an iPad screen with a colour temperature around 6500K. 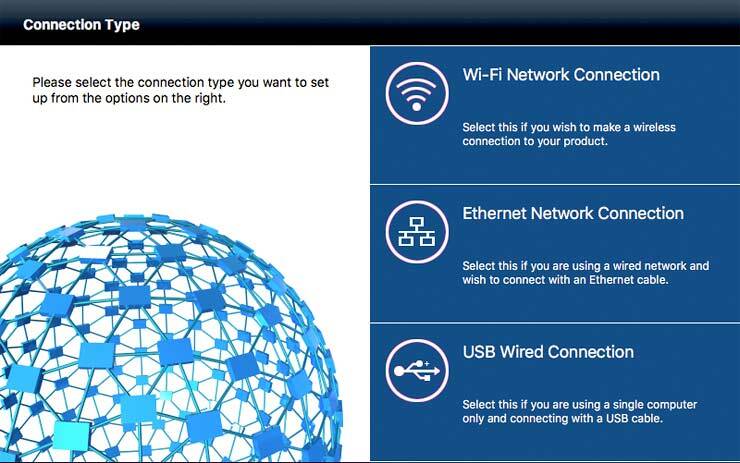 The printer can print via a direct WiFi connection to your device, even if you’ve no network setup, like we do here. 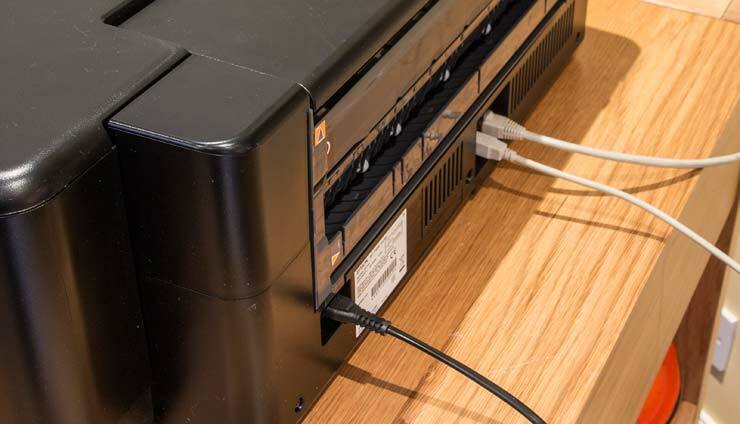 I noted that the P400 doesn’t have a ‘PictBridge’ USB socket on it for direct connection to a camera. The ink carts of the P400 are relatively light and small, and move back and forth with the print head. Access is by lifting the top panel of the printer. 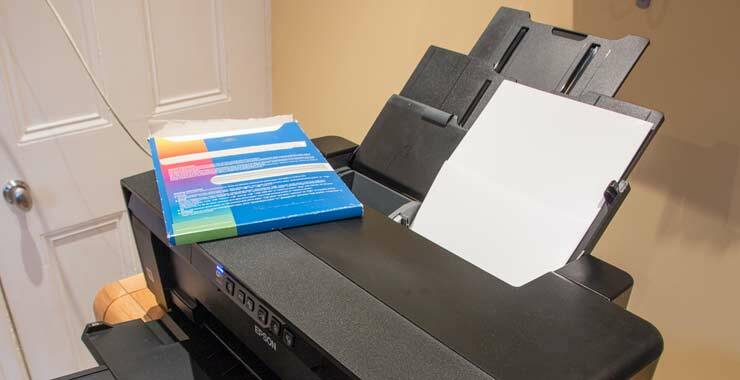 Pressing the Ink button on the front of the printer moves the print head to allow for access to the cartridges, by raising the cartridge cover. 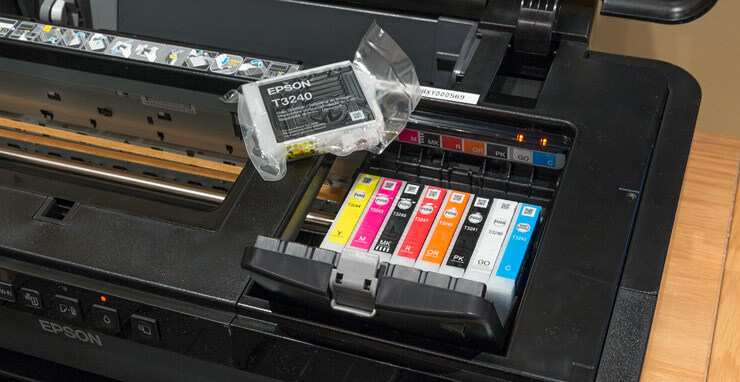 When an ink needs replacing the printer shows an orange light on the front, and the low cartridges are indicated by lights behind the head. In this case, it’s the Cyan and Gloss Optimiser that are low. Unless you are planning a very big print take the initial warnings as no more than a hint to have spare inks ready. If you print a lot on glossier papers, then the Gloss Optimiser goes down quite rapidly, but carts are considerably cheaper (~£5 instead of ~£12 in the UK). Although there are Photo Black and Matte Black inks, the appropriate one is used depending on the paper type you are printing on. 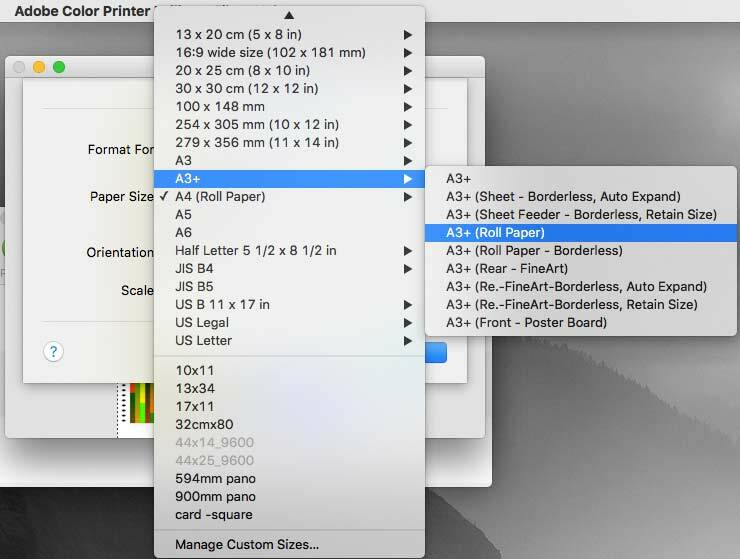 The printer supports a wide range of predefined paper sizes. Look at the number of options for A3+ (13″ x 19″) for example. It’s important to set these correctly, since if you use the wrong setting, then either nothing happens or you can easily waste a sheet of paper. 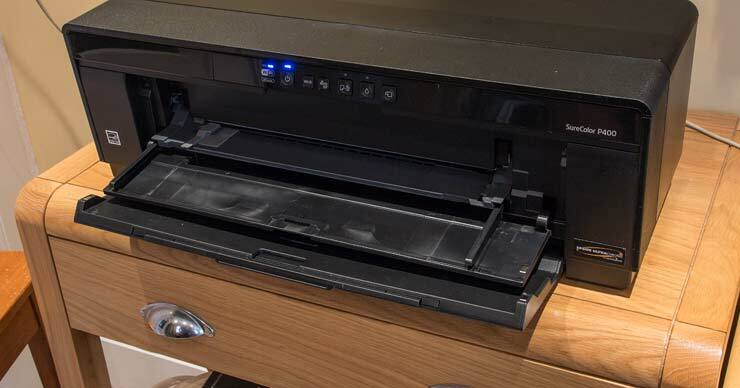 If the printer is next to you, then you can spot that nothing’s happening or a warning is flashing, but if the printer is in another room, it’s easy to just stand around waiting and wondering why your print hasn’t appeared. 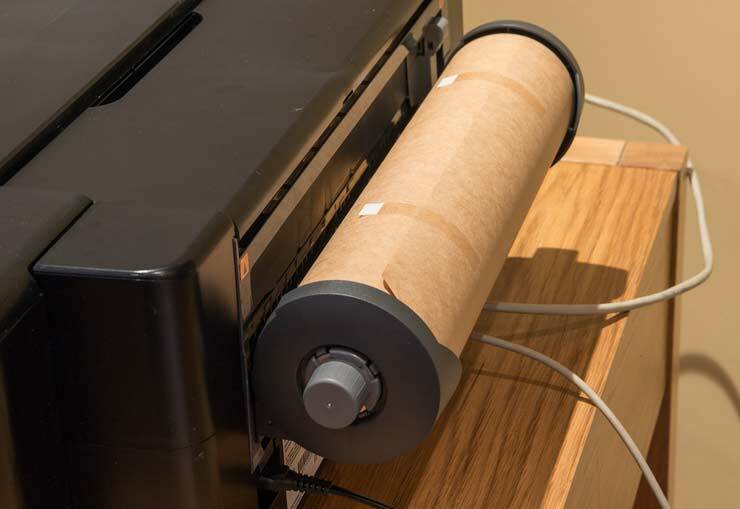 The standard paper feed is on top of the printer. The grey slide sets the width. For thicker papers, you may want to limit the number of sheets – check the manual though for which paper type/size goes where. For the cheap A4 photo paper, I just loaded up 20 sheets, which worked with no problems at all (the specifications mention a maximum of 30 for photo paper and over 100 for plain paper). The front panel lowers and extends to catch prints coming out of the printer. 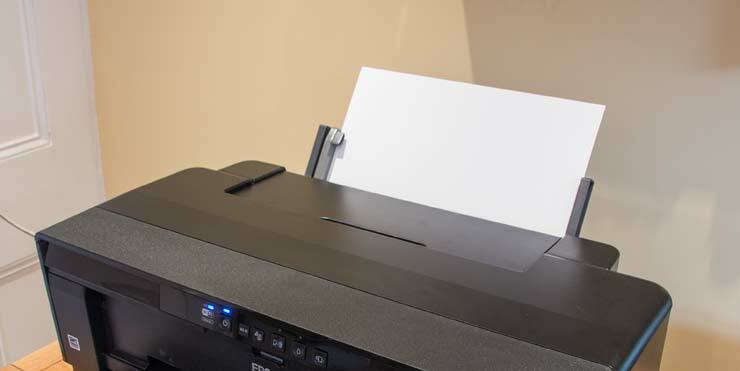 With A3+ sheets, you do need to pay attention to space behind and above the printer, such as the shelf bracket you can see. 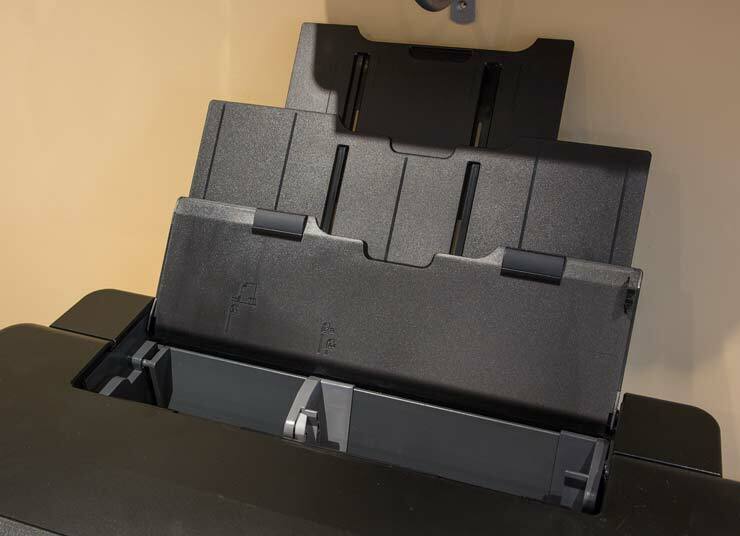 Thicker art papers need the manual feed tray fitting to the back of the printer – this just slots into place. Note the orange marks showing its top hooks. The paper should be inserted carefully but firmly into the slot, until resistance is felt. A few seconds later, the paper is -slowly- drawn into the printer. Don’t push it – the mechanism worked fine when I let it do its job. Once ready to print, it will sit in place, and needs no more attention. The print comes out of the front, just as with the other paper path. For thicker paper and board (up to 1.3mm thick), the paper needs loading at the front. The loading tray folds forward. 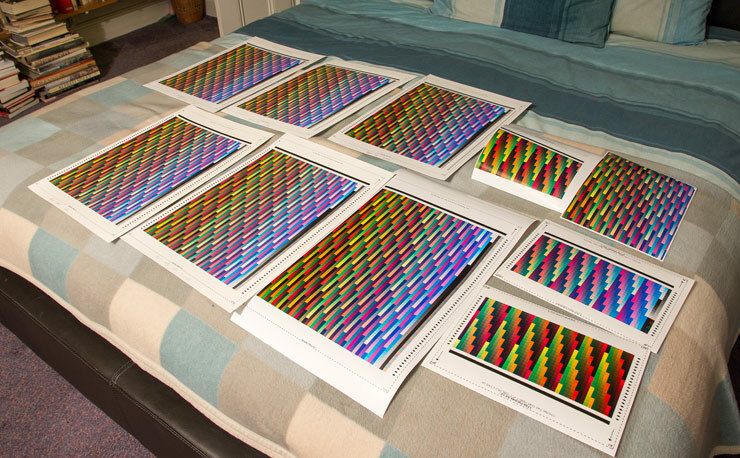 In the photo below, I’ve loaded an A3+ sheet of Epson Archival matte poster board. Note the big space needed at the back. 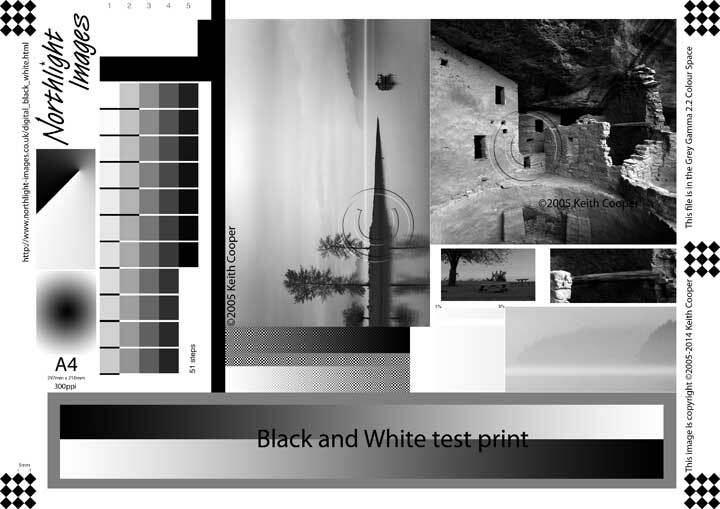 I’m printing a back and white image, using a colour profile for the type of board. I’ll come back to black and white printing in due course, but note here how I’m printing it in ‘colour’. 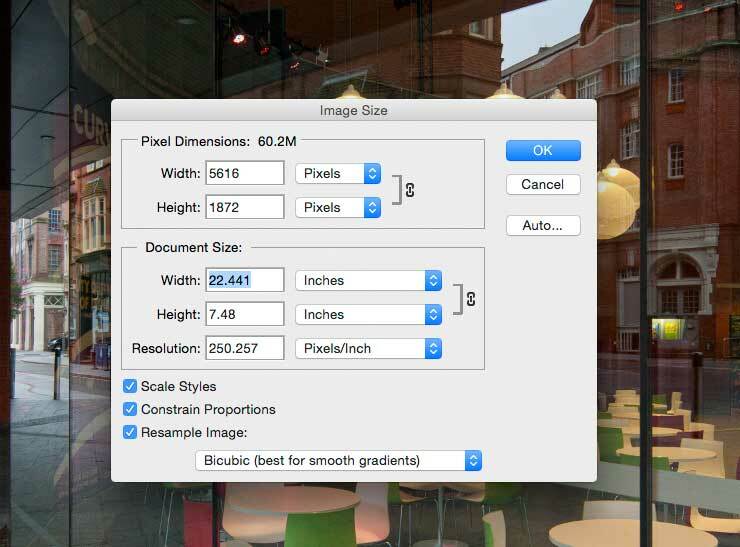 As well as the predefined paper sizes, it’s possible to create your own paper sizes, such as one I’m using for a panoramic paper (210mm x 594mm). 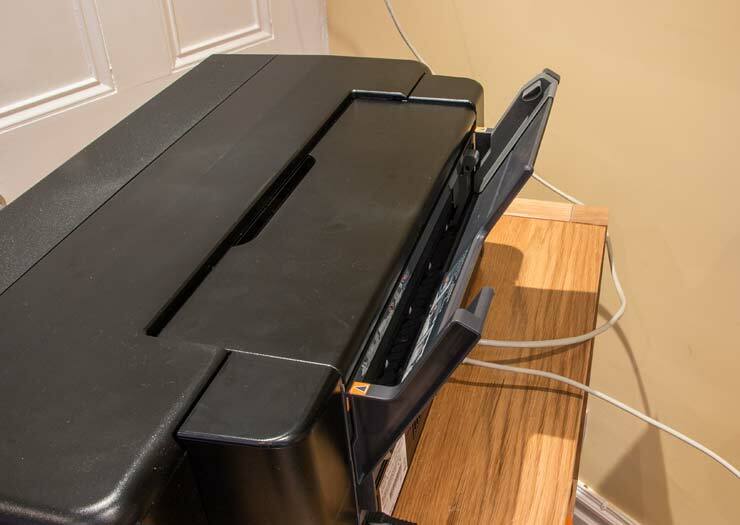 Rather than run it up the wall behind the printer, I’ve just folded it over, and rested it on the printer. I’m printing an image a bit smaller than the paper. As you can see, the custom size has margins, but (depending on the paper type) you can alter these in you custom paper setup. The final print on a glossy paper. For larger prints, you can use roll media. 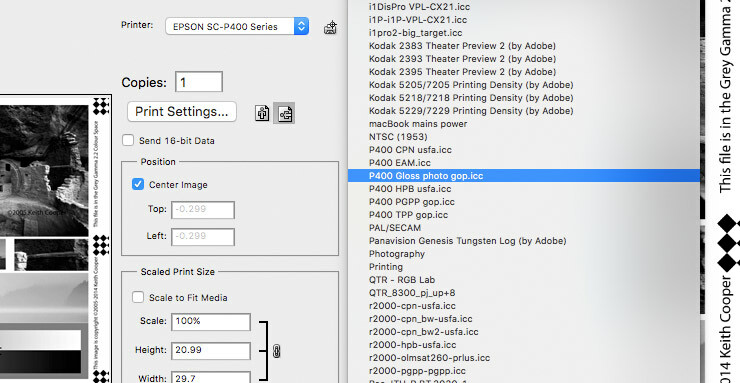 It’s important to note though that the printer takes media with a 2″ core size, not the large 3″ commonly used on printers such as the 17″ width P800 or larger. The roll paper guides fit at the back of the printer. 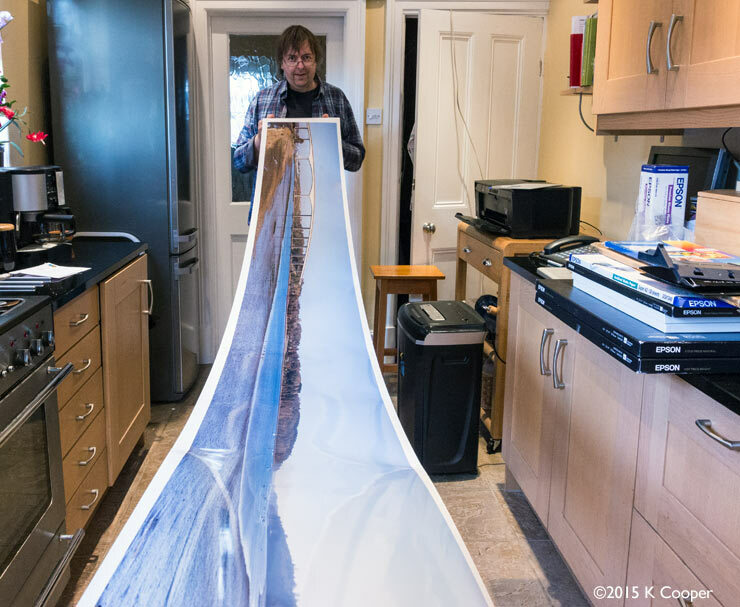 I’m testing with a 13″ width 10 metre long roll of Epson Premium Glossy Photo Paper. The paper feeds into the same rear slot that is used for the rear sheet feed unit (which I’ve removed). 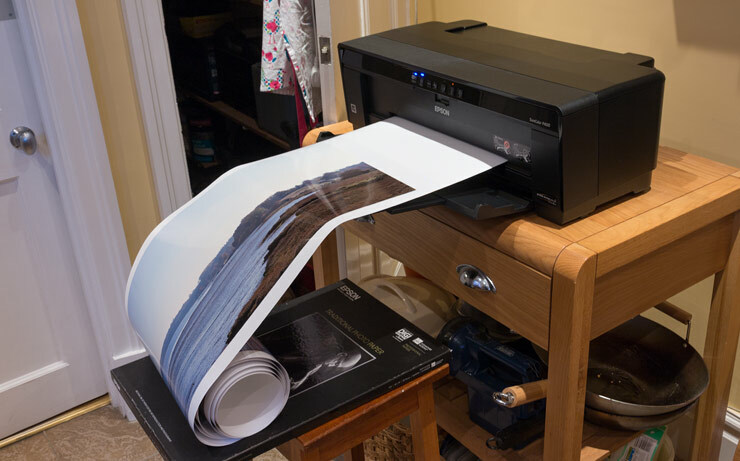 Making larger prints requires some care in handling the overhang – do not let it go to the floor. The printer paper feed is friction fed, and you do not want a lot of weight pulling on the paper. 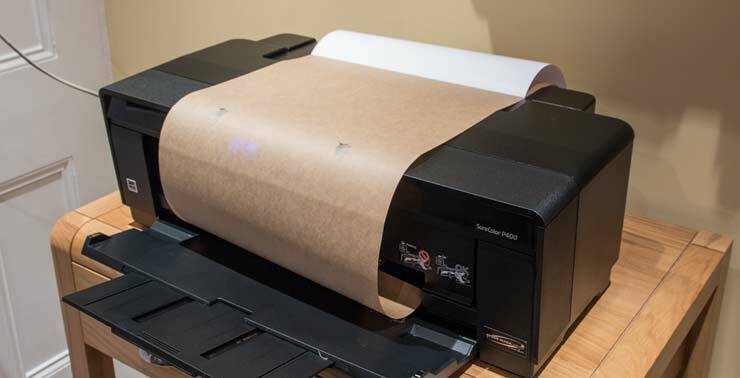 With all roll paper you need to be careful how you store prints to dry. The curl is always worse on 2 inch core rolls, and even worse as you get to the end. Keep the brown paper that the roll is wrapped in. It’s ideal for protecting the paper when you need to roll it back up again. The roll mechanism is not powered, so roll it back with care. One of the software packages for the printer provides a complete design solution for CD Printing. It has lots of sample files and clip art. Here I’ve dragged a (fish-eye) photo in place, and added some text. 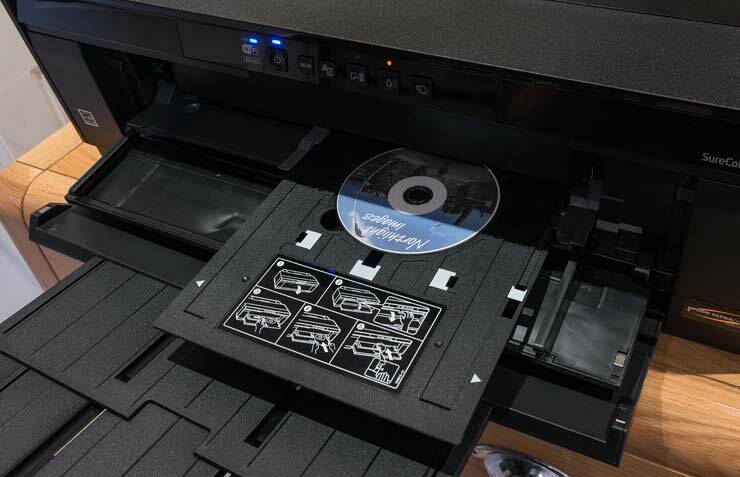 CDs/DVDs are notoriously variable in how well they take ink, so the software include numerous set-up and testing options. The blank CD is loaded into the holder and fed into the front loading slot. 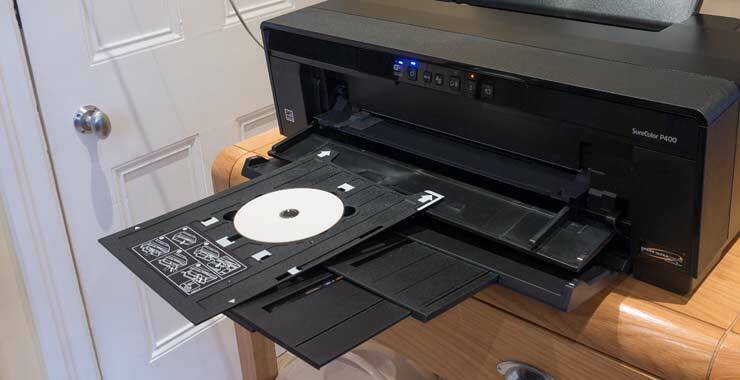 Once printing is started, the disk holder is drawn into the printer and emerges with printing. One of the nice things about testing printers, is that it gives me the chance to see images printed, that I may not otherwise get to see at full size. Well I have this image of the bridge over the River Orwell, near Ipswich. It’s a stitched image showing the bridge and estuary – a place I know well, from long before the bridge was built. I’ve sized the image to fit on a custom 3.24 metre paper size. 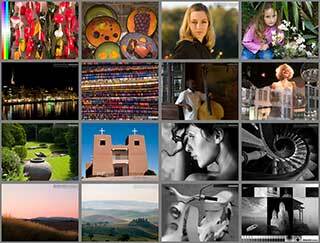 Here’s the image printed on Epson Premium Glossy Photo Paper. I’m afraid the mixed lighting in the room doesn’t quite do the print justice close up – but I think you get a feel for the size. It took less than 25 minutes to print at ‘best’ quality. Two quite different papers, one with a lightly textured lustre finish and one with a heavier smooth feel. 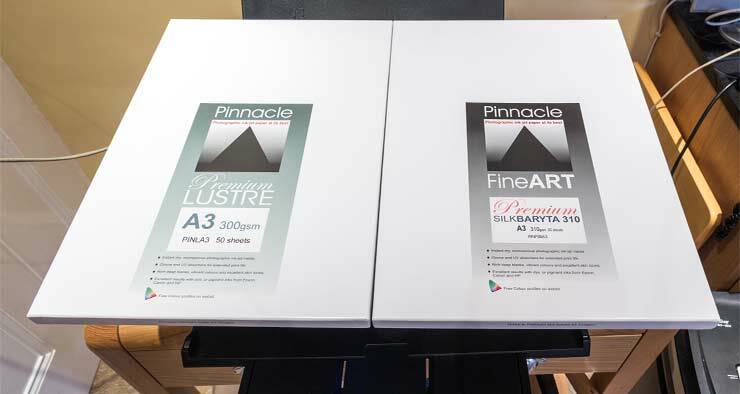 The lustre finish gives the best example of how the Hi-gloss 2 ink set with its gloss optimiser loses the gloss differential that’s often a ‘feature’ of pigment ink printers on many more shiny finish papers. 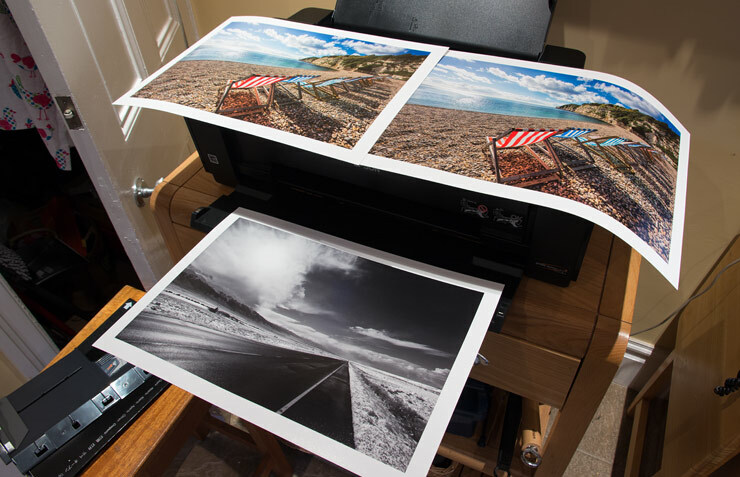 The three examples below are on the Silk Baryta paper. The top image (the beach at Beer) shows the difference between using my profile shows the subtle difference between using one of my ICC printer profiles with either Relative Colorimetric or Perceptual rendering intents. I build profiles to give a bit more contrast and saturation for Perceptual, and in this image it actually shows. There’s no automatic choice between the two – it depends on the image and how you want the print to look. The targets need printing without any colour management being applied. 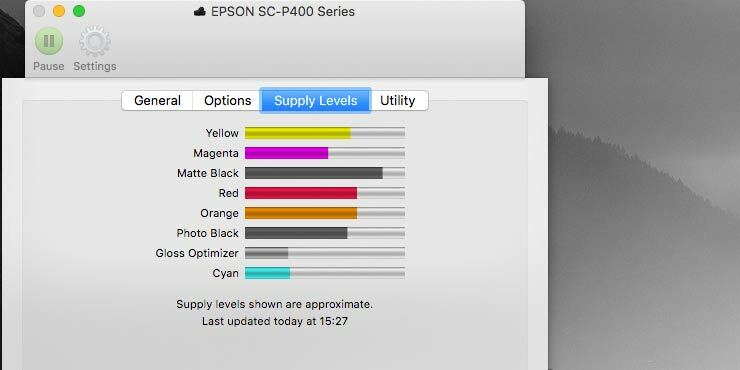 I’ll normally use the (free) Adobe Printer Utility to print the test targets, although I recently found out that the OSX ColorSync Utility (installed on any Mac) includes a ‘print as color target’ mode. The test target is measured with an X-Rite i1iSis scanning spectrophotometer. 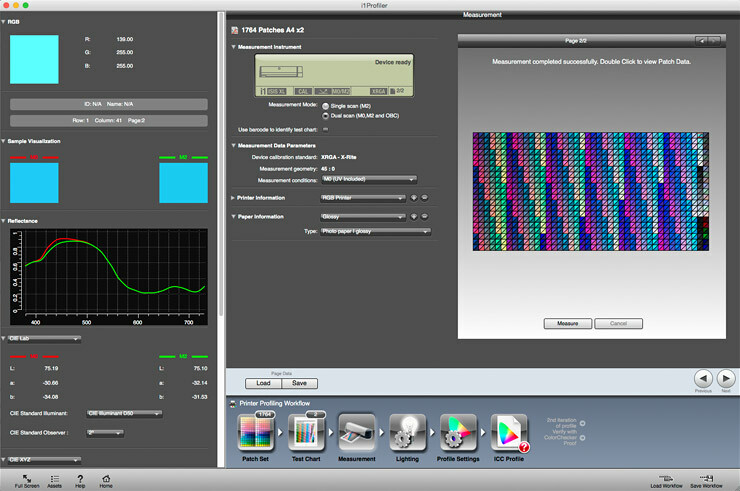 The i1Profiler software that reads the coloured patches give all kinds of additional information that can be of use in evaluating printer performance. The difference between the green and red curves above show the presence of a small amount of optical brightener in this paper (it’s the cheap glossy photo paper). Quite a few profiles are installed with the printer driver. If you’re using Epson paper, these are worth trying. Conventional wisdom has it that you need multiple black inks (greys) to get good looking black and white prints. One of the things I discovered when testing the R2000 a while ago, was that when printing with a good quality profile the printer was capable of very pleasing B&W reproduction. 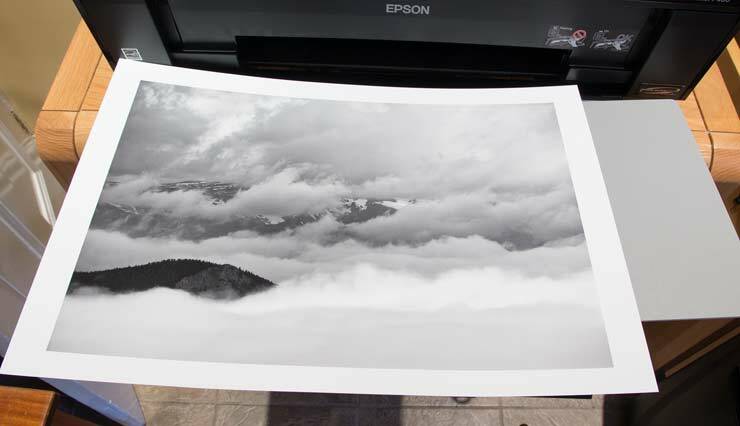 In the example below, I’m printing a view of the mountains I took in Colorado a few years ago, on Epson Hot Press Bright. It’s a smooth bright white cotton rag paper that’s part of Epson’s ‘Signature worthy’ range. The photo below shows the print against my grey reference card. The lighting is 2850K halogen, and I’ve white balanced the shot against the grey card. For a printer with no grey inks, this looks pretty good. 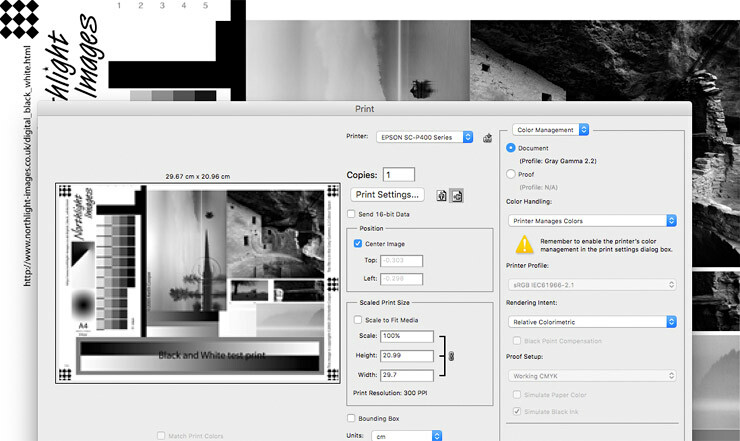 A more exacting test makes use of my B&W test image. 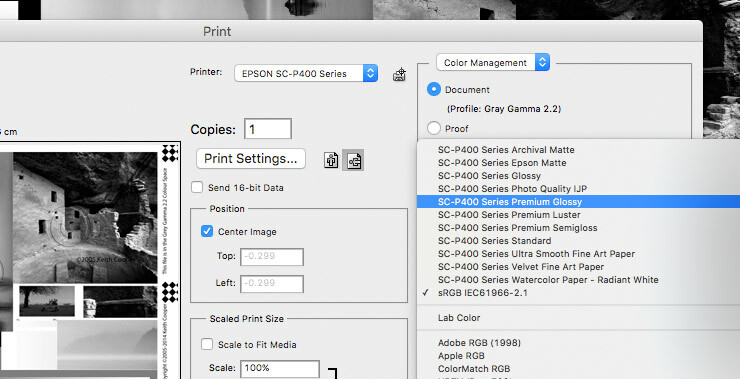 The printer driver does actually have a greyscale print mode – you need to turn off printing colour management in Photoshop (or whatever you print with). The second test print makes use of my own custom profile. 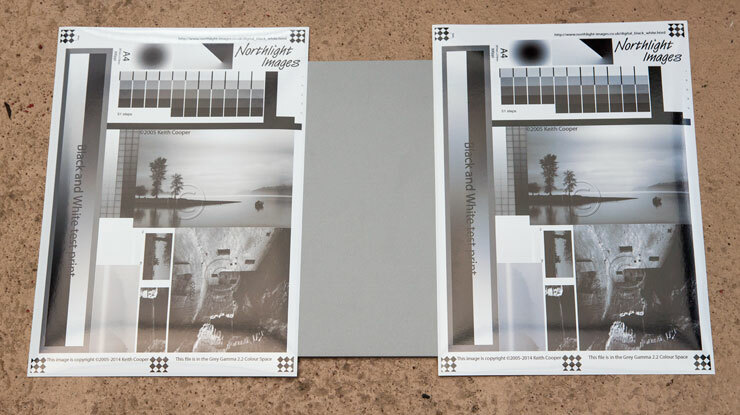 Here are the two prints – both under 2850K halogen lighting, along with my grey card. On the left is the custom profile, and on the right the driver’s greyscale mode. The greyscale print mode (with this non Epson paper) shows somewhat crunched up shadows and a rather cool look. With an Epson paper (PGPP was the one I tried) the greyscale mode was better, but to my mind, not up to the quality you could get with a good colour profile. 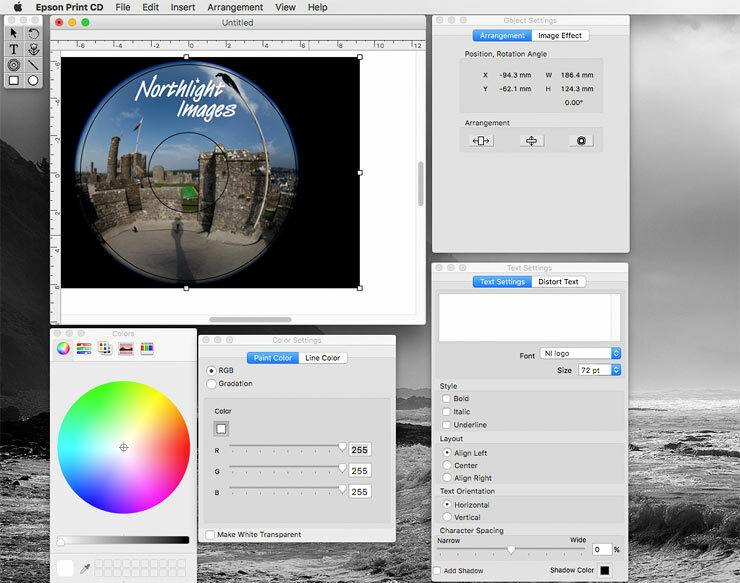 The colour profile would also allow you to apply split toning and other effects to your B&W image. 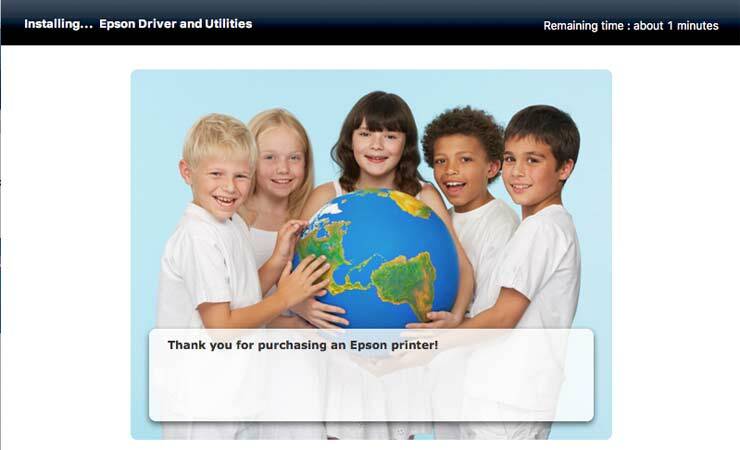 Epson Print Layout software is supplied with the printer. 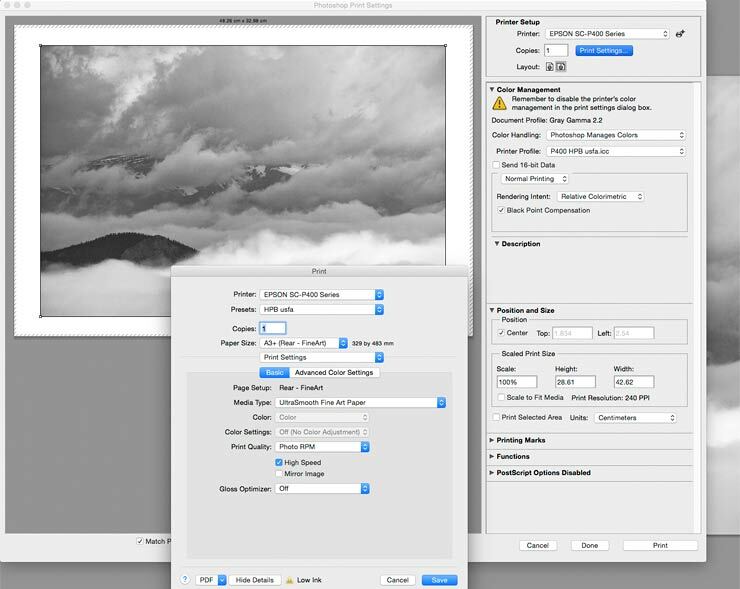 It works well and is worth a look, particularly if you’re not printing from within Photoshop, Lightroom, or some other application that supports good quality printing. 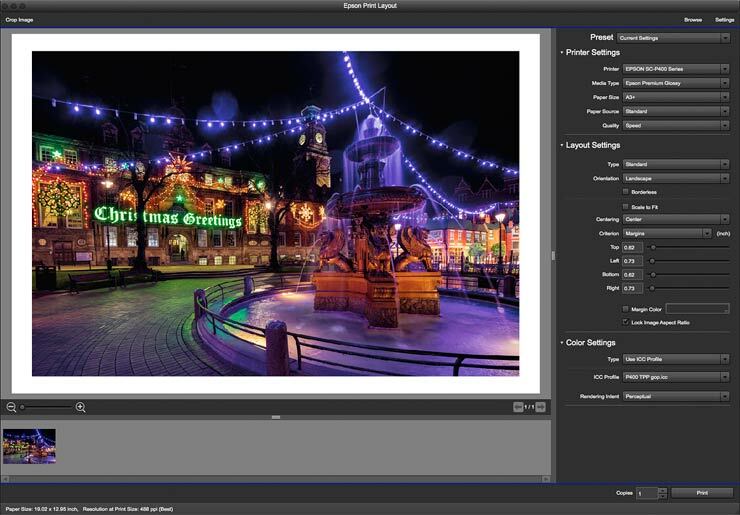 The software has improved in functionality and usability over the years, and makes print creation very easy. The image (from opening a Photoshop .PSD file) above really pushes what can be accurately reproduced, in that those lights above the fountain are a deep blue (from LED lighting). 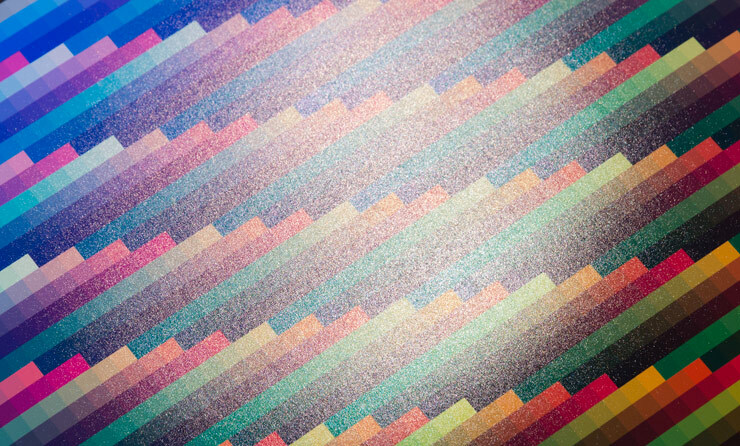 This image has many colours that push the gamut available from any inkjet printer. The colour settings section allows you to select a profile for printing and will give a broad indication of what the print will look like, and how changing rendering intent will alter things. Take care though, since this is only a soft proofing guide, and should be taken as giving an indication only of how your image will look (assuming you have a calibrated monitor of good quality too). For a pleasant daytime landscape photo, this may be quite close, but with colours like the blue lights and glowing green letters, you are showing things around the limits. Do note that I say ‘accurately reproduced’ – there can be a world of difference between accurate and ‘good looking’. I produced A3+ prints of this image on the P400 and a large format printer costing 10 times as much (which includes blue and green inks in its set). Sure enough, with a bit of tweaking, I was able to get a much stronger blue from the big printer. However, it’s only because I took the photo and worked on the image that I know about the deep blue. Real people visiting our offices expressed no preference, when asked to choose, and spent time looking to see if I’d airbrushed any people out of the photo… Indeed, one person liked the more even gloss feel of the P400 print. 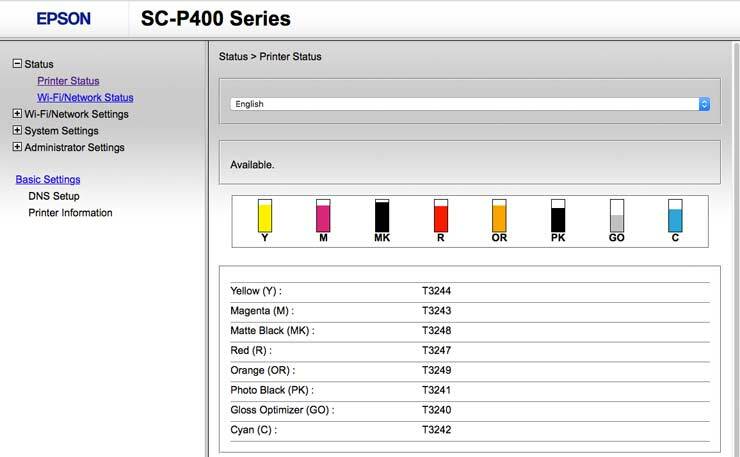 Several people asked how the P400 compared with the P600, with its very different ink set. 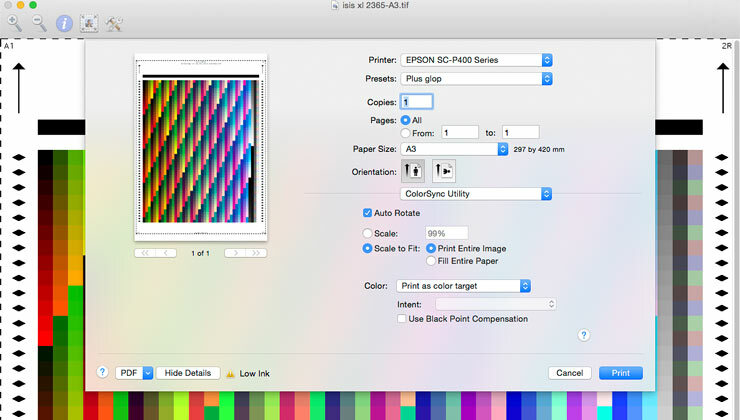 The image below is from comparing two profiles in OSX ColorSync Utility. IMPORTANT – the chart is for illustration only. Please do not read too much into it. Real world images that show any obvious difference are uncommon. The colours you see in the chart are for guidance – the ‘real’ colours will certainly exceed the range this web image will show. Both ‘blobs’ are for Epson PGPP paper and created from the same targets in my testing. 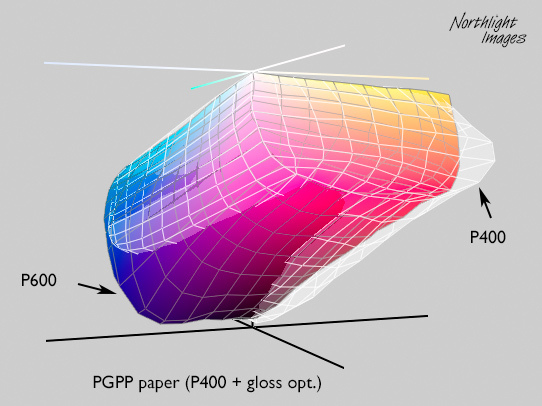 The solid shape represents the colour gamut of the P600 and the wireframe that of the P400. The gist of it is that the P600 can manage some darker saturated colours in the blue/purple area, whilst the P400 manages a bit more in lighter colours, especially reds and yellows. 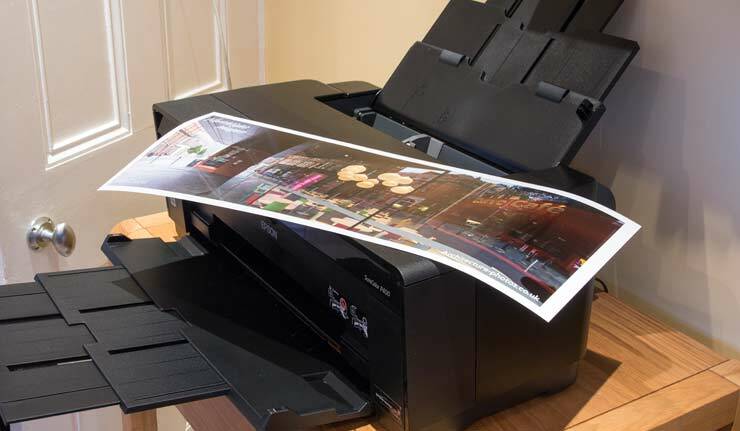 The printer is quite similar to its predecessor (R2000) and capable of producing great looking prints. Whilst I’d perhaps not make it my first choice for long panoramic prints, it’s good to see the quality of that glossy print of the River Orwell. The gloss optimiser really does finish off prints very well, and I’m pleased it costs much less than inks. If you are buying the printer, then a spare gloss cart would be a good buy at the same time. Monochrome printing on glossy papers was reasonable with a good paper profile in colour printing mode. The built in greyscale print mode is somewhat more variable once you start using third party papers – I found it a bit ‘cool’ in tone for my liking under tungsten lighting. No problems in paper handling with any of the types of paper I tried. If you are using roll paper, do take care when loading and unloading rolls – the paper guides are capable of marking paper if you are a bit rough in winding it back on to the roll. 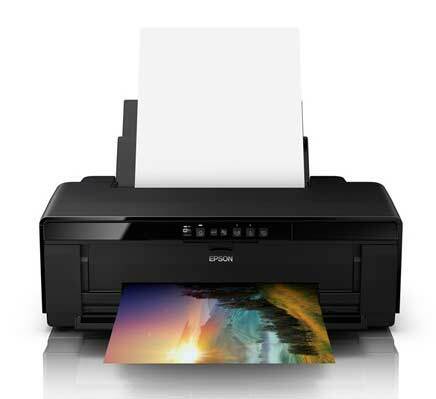 The printer offers 1440 and a much higher 5760 dpi resolution. 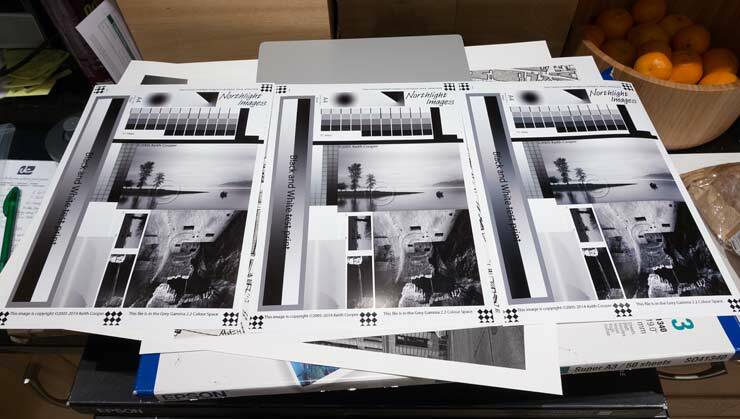 The three prints below are produced at photo, best photo and photo RPM settings. They are on the basic photo paper, with gloss coat and using an ICC profile created at the ‘best photo’ setting. 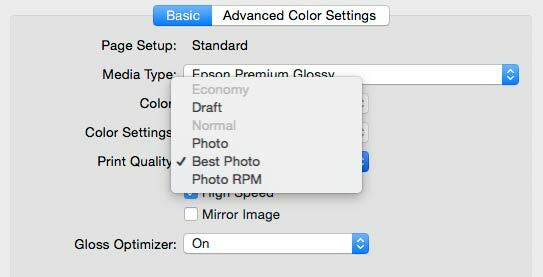 The Photo RPM print shows a distinct blueness in midtones and suggests that if you really want to use the RPM mode, then you should profile the paper at that setting. With a handlens, I can see that the RPM mode does produce the crispest fine detail in the test print, with closer smaller ink dots. The photo setting is just coarse enough that for glossy photos I’d pick the best photo setting. However, it’s not easy to see improvements in the (much slower) RPM setting, and for most images the best photo setting would be just fine. It’s not that easy to work out ink usage when doing the sorts of testing I do, but I’ve a couple of examples that show ink use. Here’s the supply levels returned when I stared to produce my profiling targets. These are the prints from the making of my first set of profiles. 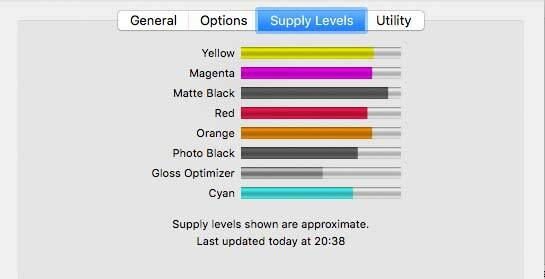 Here are the ink levels after printing – note the drop in levels. 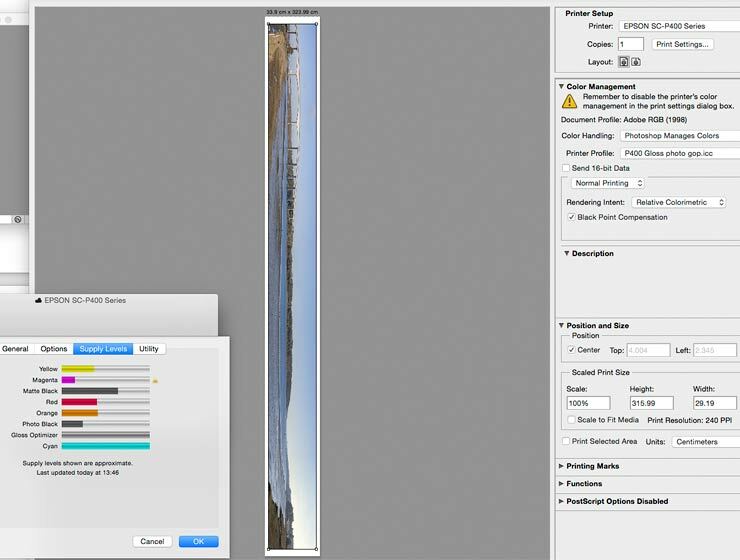 For a second example, I noted the ink settings before making the 3.2 metre panoramic print. The cyan and gloss carts are newly replaced. After the print, the biggest drop is with the Gloss optimiser – basically half a cart. I’d note though that the gloss optimiser costs less than half what you pay for an ink cartridge. One (potentially) less welcome change from the R2000, is that this printer is listed as having 14ml cartridges, whilst the R2000 specifications indicate 17ml capacity. 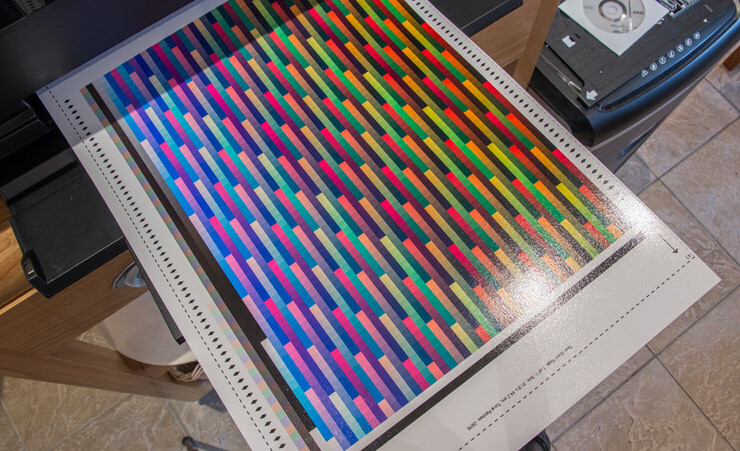 The new SureColor printers have an improved dither pattern too (how the dots of ink are layed down) so what might first a backwards step (smaller carts) is not so. 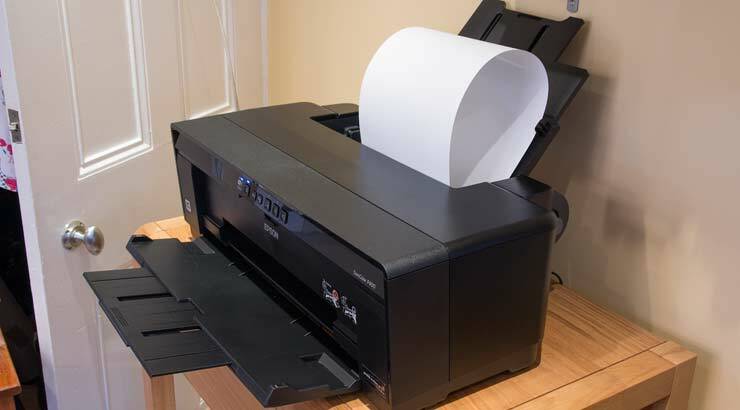 Even so, if you are going to be printing a lot, you should be aware that as you go for larger (more expensive) printers such as the P800, the cost of ink drops. The gloss optimiser subtly changes the look of prints where it is applied. This photo shows the end of a profiling test target (on PGPP roll paper), marked by the big dashed line. 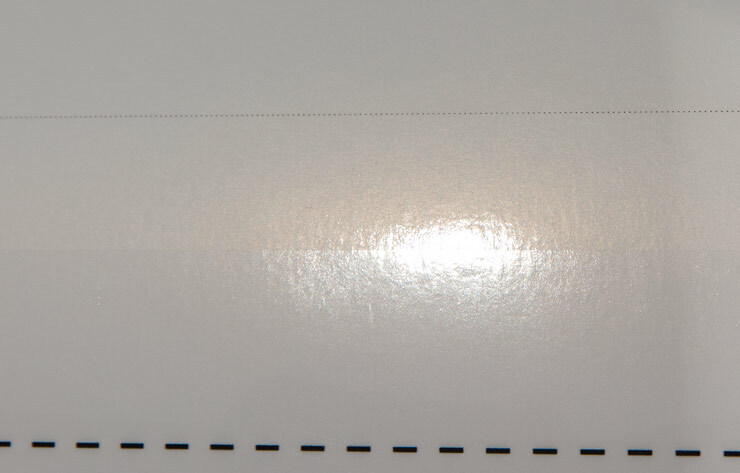 The thin dotted line is the cut mark the printer can print at the end of a roll paper print. You need to cut this yourself – large good quality wallpaper scissors work much better than a normal small pair of scissors. You can see the end of the gloss coating in the reflection of the ceiling (halogen) light. The direct reflection is not changed much, but note how the more diffuse reflection is scattering whiter light. This takes some care to see, and in normal printing, the only noticeable effect is often just to make the whitest parts of your image a bit whiter. The effect does vary considerably with paper type and it is possible to print without using the gloss coat. The printer did one cleaning cycle that I noticed when waiting to print, and there were no signs of blocked nozzles or other ink problems – this was an almost new printer though. The printer does not take kindly to paper curl and for several of the papers, I had to make sure that corners were not lifting by gentle bending. The photo (Epson TPP) shows where I’d not quite flattened the paper enough. This can afflict some stiffer papers more, and the box of TPP I was using was not a new one. 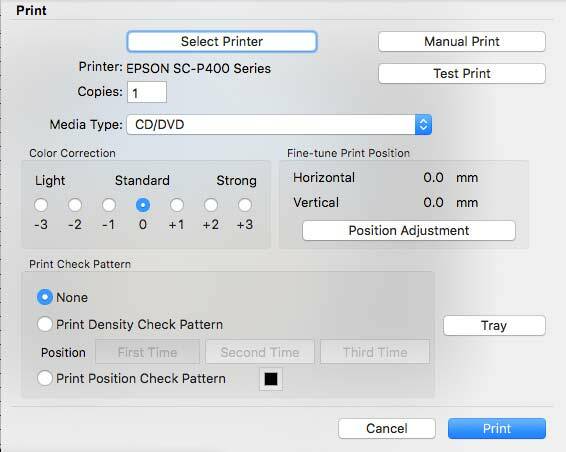 If the printer is not next to you when printing, you might want to enable the ‘check paper size’ option in the driver, since when swapping between papers it’s rather too easy to forget exactly what paper is loaded. The printer powered itself down if left unattended and when restarted rarely took more than a few seconds to get going again. 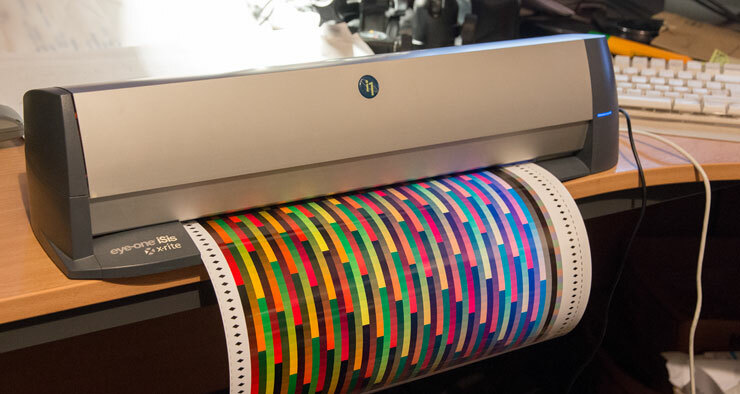 All inkjet printers hate lack of use – I try and make sure our large printer goes no longer than 5 days without some form of printing (a nozzle check will do). Should you replace your R2000 with a SC-P400? If the R2000 is working fine, then I’d see no reason to rush out and replace it. The ink cost is slightly lower. On the surface, differences seem fairly minor, but the R2000 was a printer I found very nice to use anyway. 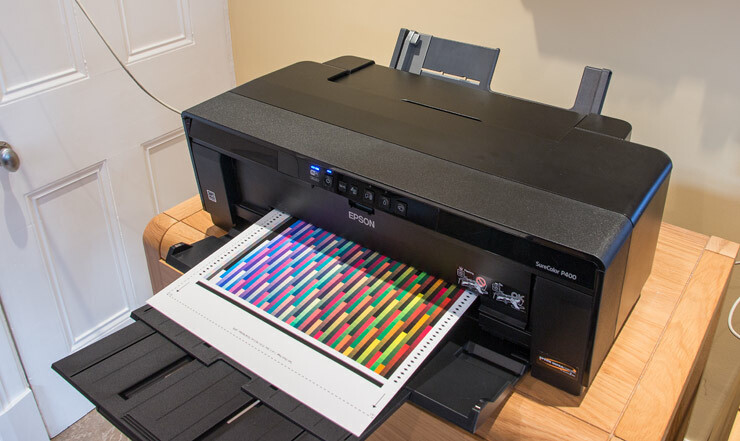 A printer capable of producing excellent colour prints, especially on glossy paper, where the gloss optimiser gives a surface finish often lacking on glossy inkjet prints. 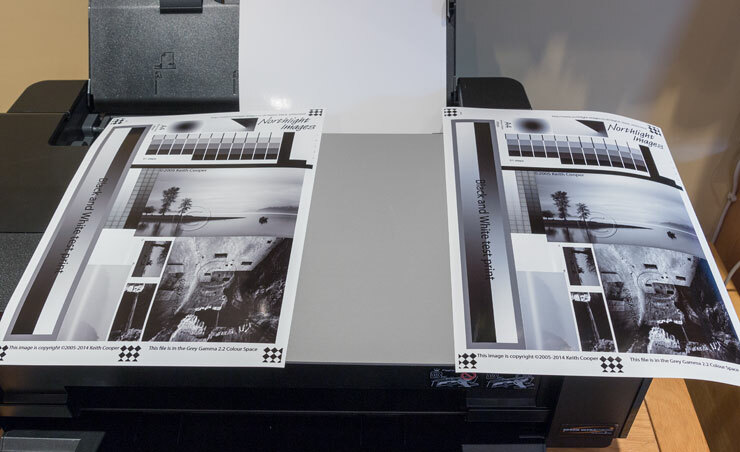 With good ICC printer profiles the printer manages excellent black and white prints on heavier art papers. A wide range of media options including roll paper make it easy to experiment with new ways of presenting photographs. Relatively small ink carts mean this is not a printer for bulk production of large prints, but load it up with a stack of 6×4 glossy paper and it will produce very acceptable borderless photoprints. 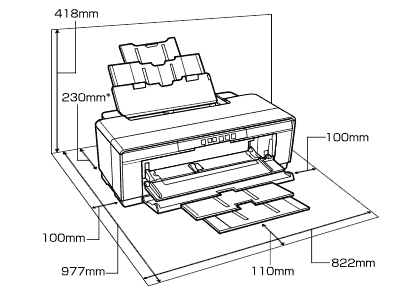 A relatively light and compact A3+ (13″ width) pigment ink printer. Inkset includes red and orange inks, which with a gloss coat ‘ink’ offers vibrant and colourful prints. Roll and sheet media support, along with CD printing and flat (board) media. Minimum Droplet Size 1.5 pl. 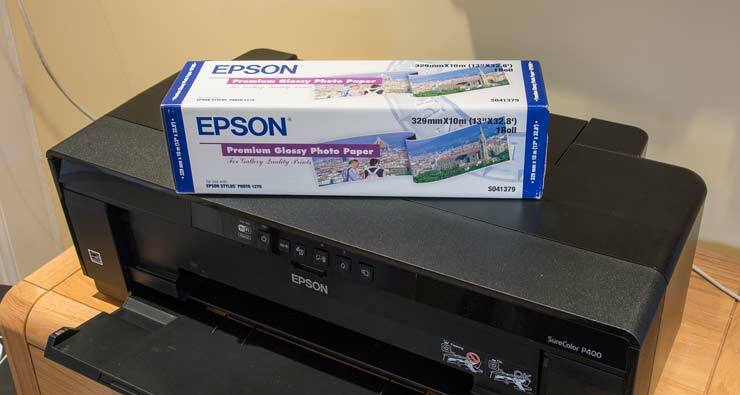 Epson Traditional Photo Paper (also known as Exhibition Fiber in some countries) +Gloss opt. Pinnacle Premium Lustre 300 +Gloss opt. Pinnacle Satin Baryta 310 +Gloss opt. ‘Best Photo paper’ – from a local stationary store – an A4 pack of their ‘best value’ paper +Gloss opt.